Art and India are in Natasha Kumar’s genes. 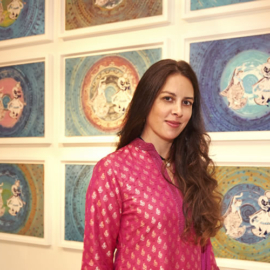 On her English side she comes from a long line of established artists: her Indian heritage she traces back to Kashmir and Afghanistan via stories of partition and lost family gold. 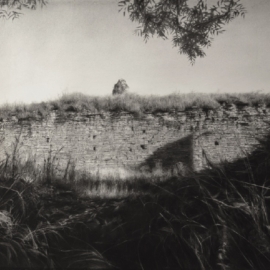 She has made her own name as an artist from the age of 17, when, earning a place by right in the Royal Academy Summer Exhibition she found her etchings hanging on the same wall as paintings by her grandfather and uncle. 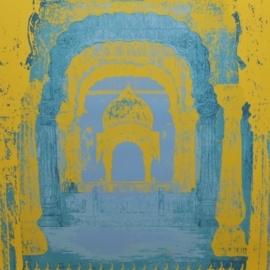 Natasha Kumar began with a first class degree in printmaking at Manchester. She studied printmaking and anatomy in Venice and completed her MA in London in 2000, winning the London Printmaking Prize the same year. She has a dedicated and growing following of collectors. Her work is represented in private and national collections worldwide. She lives and works in London. 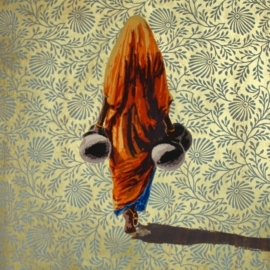 Natasha’s work offers a very genuine feel of India. Her father is Indian, and she often visits for long periods. She loves colour, obviously a very Indian thing in itself. She is very excited by opposites; writing in advertisements contrasted with the bright colours of fabric, or the lonely cow. Her use of script is very contemporary, and the resulting image, through its clarity and design proclaims itself. It is both atmospheric and compact. In hand with this delight in oppositions goes a personal conundrum, how to reconcile her Indian side with its passionate love of colour, with her English upbringing, which urges her to draw as correctly as possible, potentially exerting restraint on her feelings. She faces the two remarkably well, cutting out the sentimental and achieving a vital freshness in her work. I am always struck by how vivid her paintings are, and how evocative are her prints. 2000 – 2004 Printmaking Tutor, Sheffield Galleries and Museums Trust – The Mappin Art Gallery and Millennium Galleries. 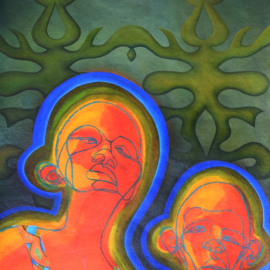 Taught numerous workshops from one to five days in zinc etching, mezzotint, drypoint, lino, woodcut and life drawing with printmaking, with slide talks, gallery tours and facilitated critical discussion among students ranging from children to adults. 2000 – 2003 Camberwell Print Workshop – Set up and resourced a full printmaking studio specializing in intaglio and woodcut, with an Albion and Hunter Penrose press, zinc and steel etching facilities. Taught students from St Martins School of Art, and other interested individuals of all ages. 1997 – 1999 The Sheffield Print Workshop Printmaking Technician- Assisted with courses in intaglio printmaking. Interview with Zee TV, about Asia House solo exhibition ‘Blow Horn’ broadcast worldwide.